On January 31, 2016 I wrote a post about the Canada2020 conference on foreign policy. I noted with particular interest the participation of former U.S. Ambassador to Canada Gordon Giffen. This was of particular interest. I had forgotten that Gordon Giffin (U.S. Ambassador to Canada in the Clinton years) grew up in Canada. Mr. Giffin actually grew up in the Toronto area and attended Richview Collegiate (Stephen Harper’s High School). He returned to the United States for College and law school. In other words, the former U.S. Ambassador to Canada clearly has “Roots” (not the store, which also has a U.S. connection) in Canada. He began by stating his view that the TPP should be understood to be an update to the NAFTA Treaty. Mr. Giffin echoed the view that Canada, the U.S. and Mexico are “in effect” part of the same “neighborhood” and that each of the three countries should have a “North America Relations Department”. Mr. Giffin made the statement (and this is a bit of a paraphrase) that it should “NOT be hard for people to move around the neighborhood”. Hmm… Do you think that FATCA and U.S. “citizenship taxation” might make it hard for North American residents to “move around the neighborhood”? – FBAR, FATCA, PFIC, Foreign Trusts, etc. Assuming you are interested in the relationship between Canada and the United States, I highly recommend the video referenced in the above tweet. If you are impatient, you should pick it up at the 57 minute mark. Judge Rose dismisses @FATCALawsuit: rules that “case is hereby TERMINATED” – Any harm NOT caused by USG but by foreign banks! On July 14, 2015, a post at the Isaac Brock Society, detailed the pleadings in the @FATCALawsuit. In late summer, @FATCALawsuit brought a motion for a preliminary injunction to enjoin the effects of FATCA on Americans abroad. The Obama administration defended the “injunction application” (in part) on the basis that any harm to Americans abroad was the result of “self-inflicted wounds“. The application was brought before Judge Thomas Rose of the United States District Court for the Southern District of Ohio, Western Division, at Dayton. On September 30, 2015 Judge Rose denied the plaintiffs application for an injunction. 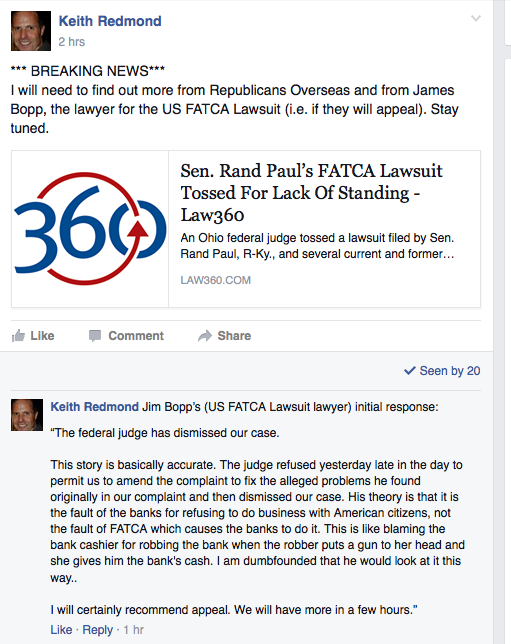 On April 25, 2016, Judge Thomas Rose terminated the @FATCALawsuit brought by Jim Bopp and organized by Republicans Overseas. Strict tax compliance has its innocent victims /via @globeandmail https://t.co/gj1llKnzgT – Bravo @BarrieMckenna for mention of # FATCA! Canada has signed an inter-governmental agreement with the US, implementing FATCA in Canada. As a result, more than 155,000 Canadian tax records were delivered from Canadian banks to CRA, which in September 2015 turned them over to the IRS, circumventing Canadian privacy legislation. Most of the holders of these accounts are ordinary Canadian citizens, whose only crime (as Mr. McKenna notes) is being born in the US to Canadian parents or who otherwise have only tenuous connections with the US. Under the agreement, the Government of Canada plans to turn over Canadian financial information to the IRS annually. This agreement was implemented by the former Conservative government, over the objections of opposition parties, including the Liberals. Now that the Liberals are in power, they reversed themselves and now insist they have no choice but to obey US demands. The Alliance for the Defence of Canadian Sovereignty (ADCS) has launched a lawsuit against the Government of Canada, opposing this agreement. The plaintiffs are two Canadian women born in the US to Canadian parents and brought back to Canada age 5 years. Have the slightest US taint? “The U.S. Government OWNS you.” @ADCSovereignty #FATCA lawsuit aims to free you! The above tweet references a Financial Post article by @JamieGolembek. In a world where FBAR is the new symbol of U.S. citizenship and Americans abroad live in a fiscal prison, you will find the comments are far more interesting. See for example this comment by David Zimmerly. This comment should be circulated far and wide! It is time to quit tinkering with the symptoms and deal with the disease! It’s called Citizenship-Based Taxation (CBT) and it is America’s utterly immoral system of financial slavery that it imposes on ANYONE with the slightest American taint, no matter where they live in the world. Born in the U.S. and moved to Canada as a baby or young child? Born in Canada and have one parent who was born in the U.S.? Ever stick an expired Green Card in a drawer and forget about it? Well guess what – the U.S. Government OWNS you, and hasn’t forgotten. You’ve been very naughty since you ran away from the plantation, so now you must be found and punished, along with your spouse and children. Yes, it is exactly like that. FATCA, the Foreign Account Tax Compliance Act, is the enforcement and sanctions tool for CBT and it is an abomination that the Government of Canada signed-up for in 2014 under the Conservatives and which the new Liberal government supports. Under FATCA, Canada’s privacy laws and Charter of Rights and Freedoms have been completely subverted to force Canadian financial institutions and the CRA to become unpaid bounty hunters for the IRS. They are now searching high and low for CANADIAN CITIZENS whose only “crime” is to have had the misfortune of an American connection. In the process, they are incurring hundreds of millions of dollars in costs which they are now stealthily passing-on to ALL Canadians in the form of higher banking fees. We keep hearing ad nauseum from this new Liberal government how “A Canadian is a Canadian is a Canadian”, yet they have sided with the former Conservative government in branding us as “American citizens abiding in Canada”. We have become second-class citizens in our own country with the stroke of a pen. If only other Canadians understood just how painful it was for us to watch Justin Trudeau’s and Barack Obama’s hollow platitudes of mutual admiration and respect last week, knowing that at least one-million Canadians have been bartered between their respective governments. It is astonishing that the Liberals have advocated so forcefully for the rights of other immigrants to retain the protections of their precious Canadian citizenship, yet they are not only allowing the United States to now claim us as their chattel but are actively aiding and abetting their efforts to hunt us down. Our only possible recourse is to continue our Charter challenge in the Federal and Supreme Courts, for we are clearly being discriminated against on the basis of our national origin. We have raised over half a million dollars in an international grassroots campaign to fight for the restitution of our basic Charter and human rights, and we will ultimately prevail. Please visit adcs-adsc.ca and isaacbrocksociety.ca for more information. In the meantime, I have no idea how members of the rapidly-metastasizing FATCA compliance industry, like the author of this article, can possibly sleep at night. They do nothing to advocate for the repeal of these indefensible laws, but they gladly profit from them. They should hang their heads in shame. natural born citizen” is a different question.) As a Canadian citizen he had the right (prior to renouncing Canadian citizenship) to live in Canada. Had Mr. Cruz, moved back to Canada, he could have avoided the U.S. S. 877A Exit Tax. Incredible but true. It will be interesting to see whether Mr. Cruz regrets renouncing his Canadian citizenship. As you will see, by renouncing Canadian citizenship, Mr. Cruz surrendered his right to avoid the United States S. 877A Exit Tax. – operate to confiscate assets that were acquired by U.S. citizens after they moved from the United States. There is not and has never been an “Exit Tax” anywhere else that operates in this way. The application of the S. 877A Exit Tax to assets located in other nations, is both an example of “American Exceptionalism” at its finest and a strong deterrent to exercising the right of expatriation granted in the “Expatriation Act of 1868“. As has been previously discussed, the Exit Tax applies ONLY to “ covered expatriates“. There are two statutory defenses to becoming a “covered expatriate”. This post is to discuss the “dual citizen from birth” defense to being treated as a “covered expatriate”. I have discovered that this defense is NOT as well known or understood as it should be. We are in year five of the Obama administration’s attempt to drag the citizens and residents of other countries into the U.S. tax net. To put it simply through FATCA (“exciting new changes in Canadian law”), a Media blitz (“Are you a U.S. Citizen, it’s time to check”), and the compliance industry (“Welcome to the U.S. Tax System”), millions of people with a “U.S. place of birth” are worried. Why are they worried? 1. Those born in the United States begin life as U.S. citizens. 2. All U.S. citizens are subject to the provisions of the U.S. Internal Revenue Code which has the practical effect of taxing people based on “place of birth”. 3. We live in a world where people have multiple citizenships and commonly change their residence from one country to another. This includes moving from their country of birth. 4. Because the United States employs “place of birth” taxation, the United States has the ability to impose direct taxation on the citizens and residents of other nations (who happen to have been born in the United States). 5. By imposing “place of birth” taxation on the citizens and residents of other nations, the United States is perfecting the art of transferring the capital of other nations to the United States Treasury. 6. The cumulative effect of this state of affairs is that U.S. “place of birth” taxation coupled with FATCA has developed into a severe interference with the sovereignty of Canada and other nations. 7. Sooner or later (probably later) the world will understand that U.S. “place of birth taxation”, is being used to extend the U.S. tax base into other nations. Should those nations object, the United States would refer to the “savings clause” in the Tax Treaty, which guarantees the right of the United States to impose taxation on those “residents and citizens” of other nations who were “Born In The USA”. 8. In other words, over time, the effect of U.S. “place of birth” taxation enforced by FATCA could be to allow the U.S. to “colonize the world”.